After a year's break, Oak Knoll Books are restarting their Fest, now to be held every two years, alternating with CODEX on the West Coast. We shall be exhibiting at the Book Fair on the Saturday and Sunday. 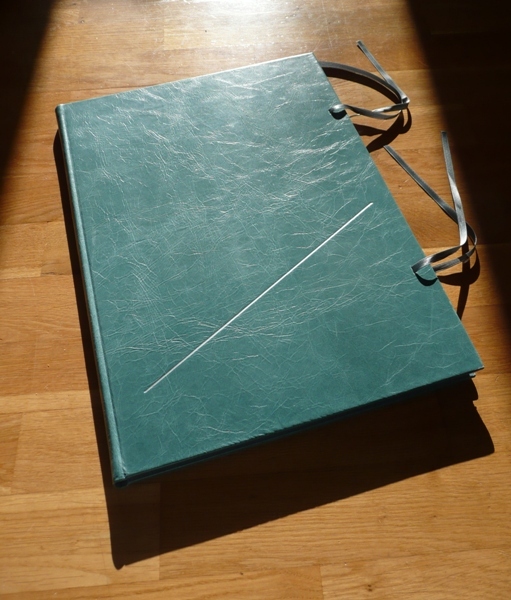 Also, Martyn will be one of the panellists at the Symposium on the Friday, joining in on the topic 'Artists' Books - Press Books: Siblings or Distant Cousins? ', as well as speaking on the Sunday morning about The Old School Press. Click here for all the details. A busy weekend. We look forward to meeting old friends and making some new ones! Copies of Winter Light are now available. We have had half of the edition bound and still have a few copies left from that tranche. The remainder will be bound in the coming weeks. I shall be sending out a brochure for the book in October. The book's artist, Hugh Buchanan, has another one-man exhibition coming up in November at Francis Kyle Gallery, London. Titled 'Words and Deeds' it is a collection of watercolours of archives, following on from recent themes of interiors and libraries. We had a glimpse of the work when we visited Hugh to get the colophon sheets signed - it will be a must-see show. The book will be on view - and for sale - at the gallery. The price is £240 (€300, US$400) but will rise to £280 (€350, US$465) at the end of Hugh's exhibition on 2 December 2010. Shipping is charged extra at cost. With some alarm I see that the last notice I wrote for this was nearly two years ago suggesting publication last year. Gulp. For new readers and those who have perhaps forgotten, I should repeat a little of what I said before as well as bring the story up-to-date - we have not been idle! The books that Henry Daniel printed and published at Worcester College in Oxford from his 'Daniel Press' are relatively well known and by and large still to be had. But in his bibliography of the Daniel Press, Falconer Madan also covered the less known output of the Daniel family from their home in Frome, Somerset. This domestic press dated from Henry's early years and was picked up by two of his brothers, Eustace and William, while he was away at school and later studying in London and then Oxford. After Henry had left home and established himself, and his press, at Worcester College the brothers and their father continued printing small items, in particular for the church at which Daniel's father was vicar (a post that Eustace was later to take over). Some were clearly juvenile and amateur works, but much of it was ephemeral material for use in running the church. They include nine items that Madan refers to as 'books' and also hundreds of other items that are classed under the heading of 'Frome minor pieces' (of which some are but 'minima'), but, in contrast to the Oxford books, these are as good as unknown and almost never seen. Henry's father was vicar of Holy Trinity, Frome and their home was the Georgian vicarage next door, a fine house now a private residence. Daniel and his brothers and father printed a large number of items for the church's daily affairs as well as items for more general consumption including bookplates for over fifty family members and friends. David Chambers and I have tracked down, examined, and catalogued nearly 1,000 individual items in seven substantial collections of the Frome output, and, taken together, they are providing us with insights into 'The Daniel Press in Frome' as well as allowing us to add at least seventy-five hitherto unrecorded items to Madan's inventory. Our new title will, we hope, redress the balance and provide some insights not only into the early work of a formative private press but also the role of an amateur press in its social setting. We are now well advanced with the text and have reached the point where those niggly small points need to be sorted and references checked. We have taken the opportunity to provide more information on the printers and edition sizes of many items, information that Madan omitted from his bibliography. The edition will probably be 150 copies and the text about 72pp with, I hope, a great many reproductions of this rarely-to-be-seen material, some items existing in - as far as we have found - but one or two copies. It will be printed in 12pt Caslon, possibly on a small stock of T Edmonds pale-blue laid that I acquired some years back. The book will match Madan's bibliography in size, and be bound quarter cloth with paper on the boards and a paper spine label. Realistically, I think publication will be mid-2011 and I hope we can send out more precise details, including price, later this year. Expressions of interest gratefully received.